In this guide we will walk you through the process of creating a Formyoula form and linking the from to a Salesforce object. If you have any questions please email us Support@Formyoula.com. We have recently added a new form element called NPS (Net Promoter Score). NPS surveys are great to get feedback from your customers and understand how they feel about your service. It can reduce churn and build customer engagement. The NPS element can be used for online surveys or mobile offline forms. When used as an online survey the NPS score can be pre-filled from a URL link. This works great, if you include the NPS score buttons in your email templates. Clicking on a button will open the survey and pre-fill the selected score. This guide will take you through the steps to enable Formyoula tabs for your users. 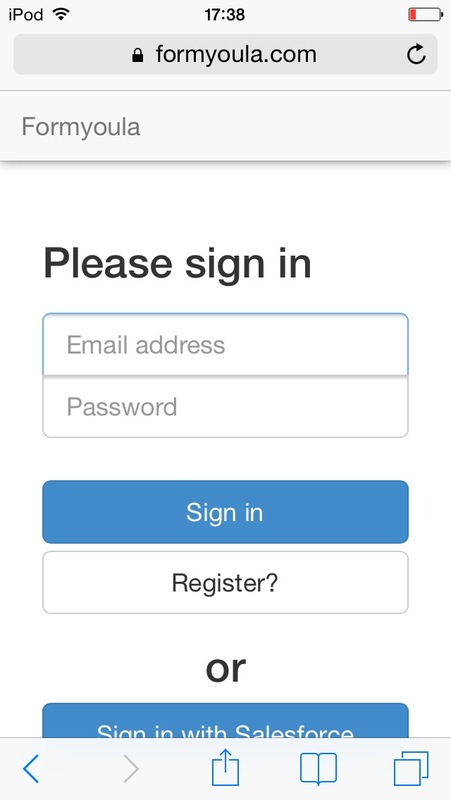 We are always exploring ways how to enable our mobile forms to as many devices as possible. Today we are happy to announce that our mobile app is available as a web app. What does this mean for our users? Put it simply, you can fill in any form using your browser. Just point your mobile or desktop browser to formyoula.com/mobile and you will be able to start filling in your forms. iOS(iPhone & iPad) and Android device users can save the web app on their home screen. This will enable the app to work offline and it will act like a standalone application on your device. Select Chrome browser options and click on "Add to Home Screen"
We have some great news for all Salesforce users, Formyoula is now available on the Salesforce1 mobile app. All the field types are supported, you can even capture videos and record audio. Here is the link – https://appexchange.salesforce.com/listingDetail?listingId=a0N3000000B4ijNEAR. After you have installed the Formyoula application from the AppExchange, please follow below steps to enable the Formyoula tab on your Salesforce1 mobile app. In the "Quick Find" search type in "Connected Apps". 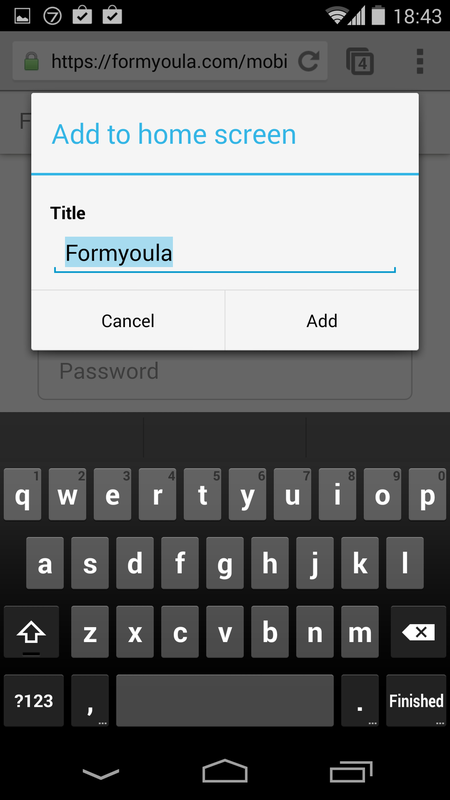 Click "Edit" on Formyoula Mobile Web. Update the "Permitted Users" option to "Admin approved..." and click save. Back on the "Formyoula Mobile Web" connected app click "Manage Profiles" and select the profiles that will have access to the app. When done, search for "Mobile Negotiation" in the "Quick Find". Select "Formyoula Mobile" as one of the available tabs for Salesforce1 mobile.